This month’s Cause Marketing Masters Webinar took a deep dive into cause placement in the entertainment industry. You’ve heard of product placement? 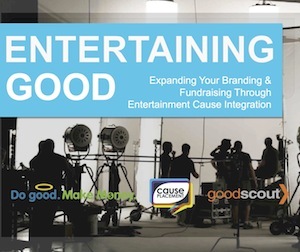 This is nonprofit, or cause, placement which our presenters Phil McCarty and Laura Probst define as a collaboration between causes and content providers, embedding messaging and marketing into the influential channels of entertainment. Is This About Celebrities? Not to be confused with celebrity cause marketing (although celebrity personalities certainly could be included), “entertainment” runs the gamut from movies to television, Broadway shows to publishing, music to gaming. 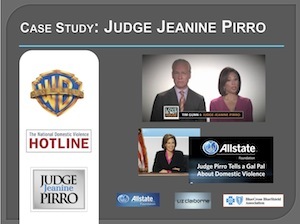 The Judge Jeanine Pirro Show and The National Domestic Violence Hotline Just one of the many examples shared with us during the webinar: a partnership between court TV show Judge Jeanine Pirro and the National Domestic Violence Hotline (Judge Pirro was a domestic violence prosecutor). After one show mention, the Hotline saw their call volume increase by 400% and decided to approach the show’s producers. They suggested an entire campaign around domestic violence month for the Judge Jeanine Pirro show. Needing a new public relations angle, the producers took an interest in the partnership also hoping for deeper viewer engagement in order to demonstrate value to their advertisers. The Hotline’s objectives were simple: more people using the Hotline and donor funds to keep the resource running. Integrating Relevant Content For the month-long campaign, Judge Pirro saw three domestic violence cases each week in October integrating relevant content, on which the Hotline consulted. At the end of each case, the Hotline number was shown on screen, and show visitors received informational cards. Incorporating Brand Partnership Furthering the effort, the team went to Allstate and Liz Claiborne (who both had a domestic violence focus) and did joint PSAs. They also conducted a series of media interviews. The Results The results? Hotline call volume was up 4000% for that month – and the Hotline received new donations from corporate partners who were pleased with the additional exposure. The Judge Jeanine Pirro Show increased viewer engagement as well as earned a huge boost in PR – almost 400% over what was typical. Judge Jeanine Pirro herself also received increased visibility and ultimately ended up with a new show. Getting A Foot in the Door The key to these entertainment industry partnerships is patience, creativity and networking. Getting a foot in the door isn’t just as simple as picking up the phone. It involves research into the industry to learn what new movies and shows are being considered and where the mission match might be for your nonprofit or brand. Starting places include: Movie Insider, IMDb, Variety, Hollywood Health & Society, Entertainment Industries Council and the Creative Coalition, to name just a few of the resources shared in the webinar. Powerful Partnerships Leverage All Available Assets Partnerships in the entertainment industry can result in an incredible boost to a cause marketing effort providing an unparalleled opportunity to reach millions of eyeballs (and engaged ones, to boot!). The value of these types of partnerships cannot be understated but they do take up precious resources, copious amounts of creativity and plenty of resourcefulness and patience. If you’re a Cause Marketing Forum member, we highly recommend you take the time to view this webinar (it’s free as part of your membership). For those of you not yet Members, you can access a copy of the recorded presentation for $99 here. This was very informational and fun for me to read about, seeing as how we are discussing CSR and how companies use specific strategies in one of my classes. I really liked the fact that the hotline got so many donations. I think it’s great that so many people were willing to cooperate. This article definitely helped me realize how important strategy is when trying to help a cause.